Given all that, does it seem to you that there’s a renewed interest in illustration generally and in, particular, fashion illustration? RT: I hope so. 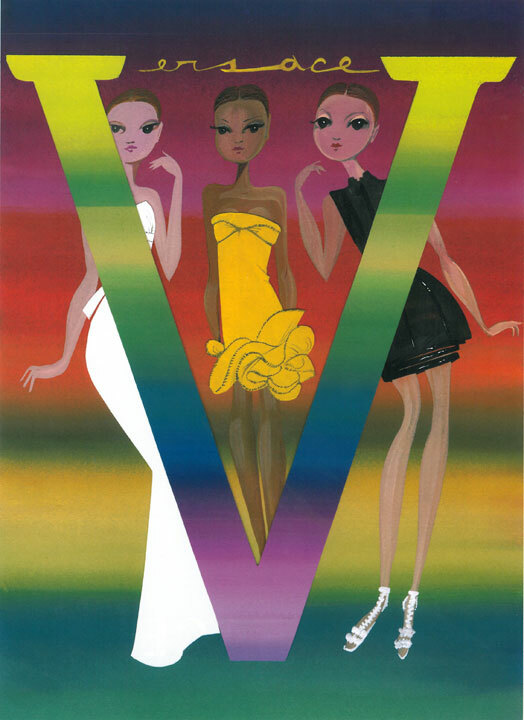 Fashion illustration is the best shorthand for great design. For me, fashion has always been the great communicator. It’s the glue that binds us all together. It’s the language of modernity. It’s as subversive and as flexible as modern life has become. 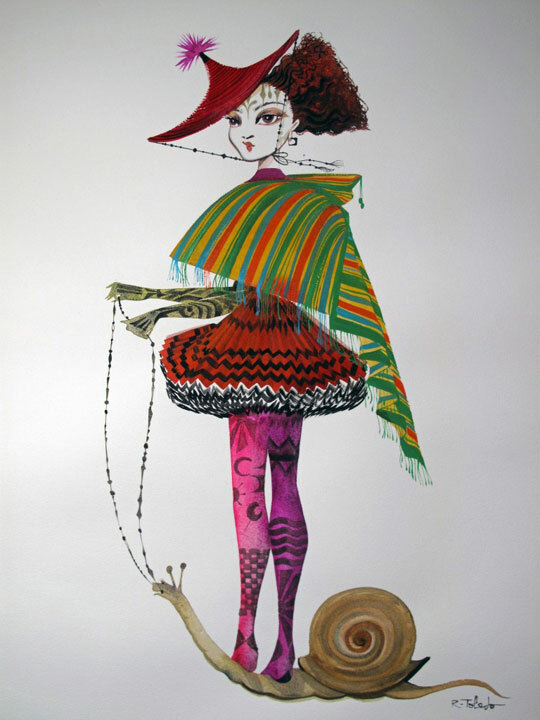 Fashion illustration fascinates and charms the viewer in its momentary suspension from reality. It allows you to dream and see, in your mind’s eye, what is not there. 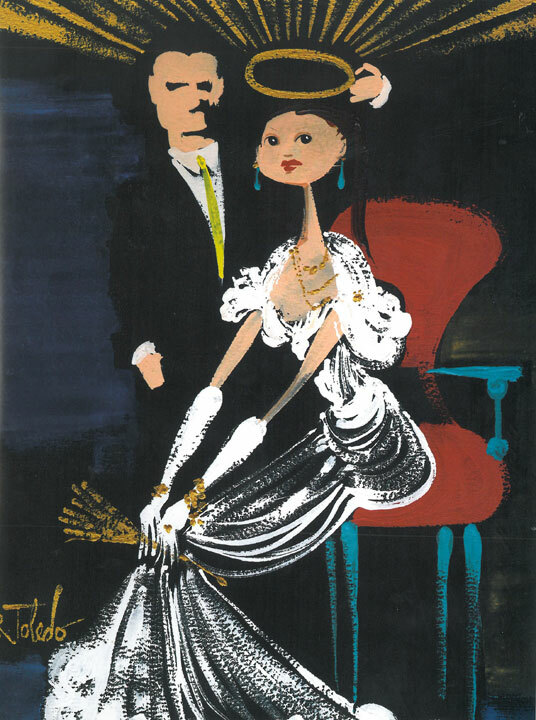 Who, in your mind, are the all-time great fashion illustrators of this or any age? 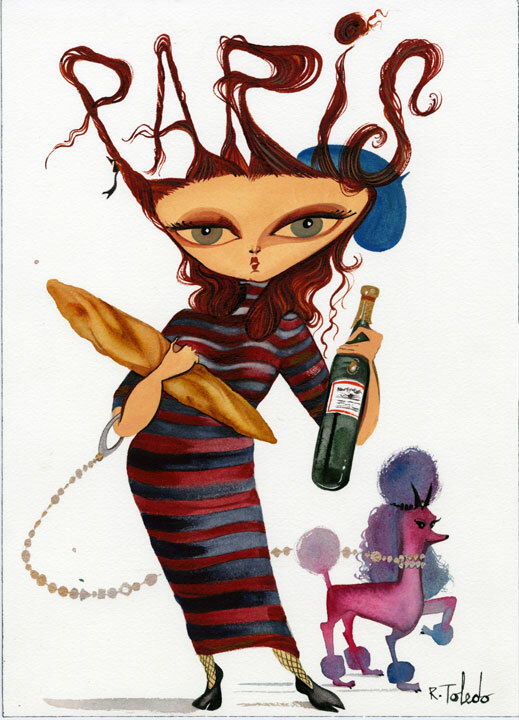 RT: I have too long a list but, for me, you can’t be a good fashion illustrator without first being a good artist. And, in my view, it all starts with the cave men and women, drawing on the walls of caves and reporting on the day’s events and postures of the moment, documenting what seems important and essential to pass on for future evaluation. All the masters from the Renaissance – Botticelli to Pierro della Francesca; Rembrandt to Vermeer to da Vinci – all excelled at depicting the style and flavor of their days. This ability is a pre-requisite of being a good artist and must be a part of your repertoire . It continues into the dawn of our modern times – from Matisse to Picasso and Cocteau; from Dali to Dufy and Kees Van Dongen – all of whom did modern descriptive and magical renditions of fashion during the 20s, 30s and 40s. It then continues with Eduardo Garcia Benito, André Éduardo Marty, Georges Lepape, Marcel Vertes, Christian Bérard, Tom Keogh, René Gruau, and on to the great Antonio Lopez, Andy Warhol, Jean -Paul Goude, Tony Viramontes , Michael Vollbracht, Fernando Botero, David Hockney, Steven Stipelman and Kenneth Paul Block. And my friends Pater Sato, Mats Gustafson, Jean-Philippe Delhomme, Franҫois Berthoud, Gladys Perint Palmer and a whole slew of young kids working today, in every media you can imagine. When you were starting out, were you inspired by the illustrators who were working at the time and, if so, who? RT: I didn’t start out to be a fashion illustrator. It was all a happy accident. I was an artist who happened to fall in love with a fashion designer, so it is through my wife, Isabel, that I discovered the art of fashion. 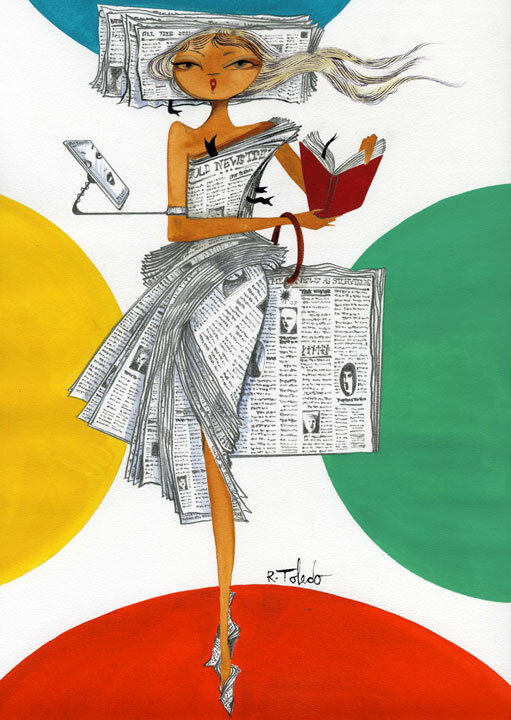 In creating a fashion illustration, what do you hope to accomplish? RT: I love photography and film. In fact, I started with photography, but I discovered I was faster with a pencil and a brush than with my camera, so I set out to capture a mood; a feeling that’s more personal and intuitive; more human than photography; to capture the aura of fashion; the graphic punch of a symbol that implies and suggests the fashion and clearly describes the design. I love the handmade; the human touch. I’m addicted to humanity and that’s why I’m still so low tech. 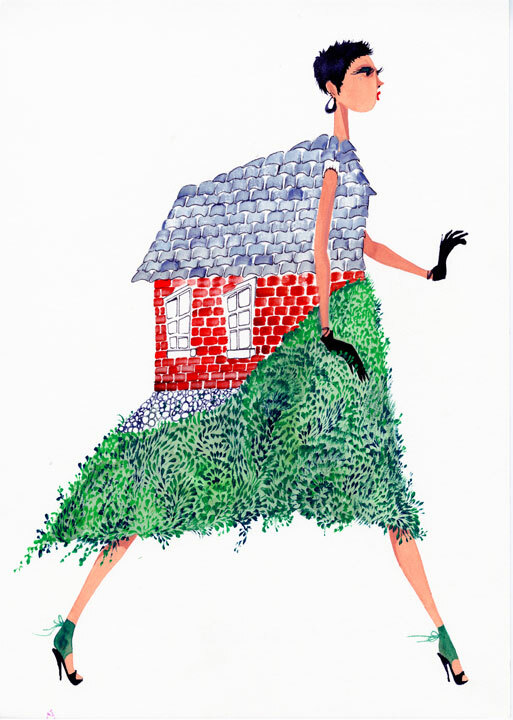 What do you think a fashion illustration accomplishes that a photograph cannot? RT: It can hint at the future while describing the present. You’ve been quoted as saying that Isabel is the whole reason you do fashion illustration. How did that come about? RT: When I met Isabel, I really met fashion head-on. Isabel has been sewing since she was a kid and was totally immersed in the art of inventing fashion. She’s like a cloth scientist, and it’s because of Isabel that I learned to make patterns and got to see, first hand, how clothing is made and put together. It was in this way that I became fascinated by the secret rituals of cutting patterns and cloth; sewing clothes; weaving and knitting. This magical world of creating galvanized me into the attempt to draw the process; painting and documenting the clothes and the models and, in fact, the world that fashion functions in. This first hand, full-on immersion into the specialized techniques of fashion allows me to understand and draw the clothes well. In her memoir, called Roots of Style, Isabel wrote that “fashion is what time looks like, and is an important and valid piece of the larger puzzle of life and society,” which is one of the many things I learned from her. One of my first paying jobs in the fashion industry was the series of satirical fashion cartoons I did for Details magazine. When Annie Flanders bravely handed me that assignment, my fascination with the world of fashion blossomed. What is the relationship between your art and Isabel’s design? RT: My art work is totally triggered by Isabel’s design work. The textiles she’s working with; the techniques she’s experimenting with; how her seams are being molded; the shapes and silhouettes she’s creating. All this guides my art work; my paint strokes and my shapes and forms which, I hope, inspire Isabel’s fashion design work. It’s really a tennis match of creativity. RT: That’s really a huge compliment and not for me to say. I’m a lucky man to be working in fashion with the most thought-provoking designers of our time. I’m always floored by the level of creativity, commitment and excellence infused into fashion collections – season after season, year after year. The ephemeral and intangible quality of fashion, the very thing that makes it such a modern art form, is what the mystery of creation is all about for me. It would probably be true that your early days – yours and Isabel’s – had a fair share of difficulties and struggles. Have your many, many awards, recognitions, successes and fame changed either of you? If so, in what way. If not, why not? RT: An artist’s work is never really done or completed, and life is always changing and shifting. I learned very early on not to believe your own hype. But, that said, getting any sort of recognition is a big honor and gives you the opportunity to share your experience with the next generation. Awards are life savers for artists. For us, our awards have been a real life line that extends a helping hand to artists and helps us find a way forward. One might think that some friction might arise in the course of living together and working together, 24/7. What would you have to say about that? RT: Creative friction is a welcome aspect of invention. Making something new creates friction and sparks. In fact, this may be the secret of a long-lasting love affair. Opposites do, indeed, attract, and it doesn’t get much more opposite, when it comes to character and aesthetics, than we Toledos. RT: My life. My wife. Isabel’s work. My friends. My studio. My city. Music, movies and dreams!